Joseph Kabila, President of the Democratic Republic of the Congo, is half way through his second term in office and appears to be laying the ground work to continue as President after his current mandate expires in January 2017—even though the Constitution not only places a two-term limit on a president, but also specifically stipulates that the two-term limit cannot be changed. There is near universal opposition to a third term in office for Kabila among the Congo’s diverse civil society organizations, churches, and notoriously fractious opposition parties, as well within the international community. It is feared that if Joseph Kabila finds a way to remain as President after his second term ends, political and social chaos will ensue, the military will splinter along competing allegiances, and the country will erupt into widespread violence, if not all-out civil war again, as various leaders and groups use armed violence to oust the ‘illegitimate’ president… in hopes being Kabila’s successor. Joseph Kabila has been President of the Democratic Republic of the Congo since 2001. He was appointed President at the age of 29 immediately following the assassination of his father, President Laurent Kabila. In 2006, Kabila won the national elections and began his first official term as President. Despite the ongoing armed conflict in the eastern region of the country, international observers described these elections as generally free and fair—the first democratic elections in the DR Congo in 40 years. In the October 2011 elections, the Election Commission again declared Joseph Kabila the winner and he began his second term as President. This time, however, Congolese and international election monitors widely condemned the elections as fraudulent. Main opposition leader, Etienne Tshisekedi, claimed victory and held his own a swearing-in ceremony. Fearful of violence, the international community and Congolese people reluctantly accepted Kabila as the President. President Kabala is now half way through his second 5-year term in office. Article 70 of the Constitution says a president may only serve two terms in office and that a term in office is five years. Further, Article 220 of the Constitution says this two-term limit cannot be changed. There is deep concern that President Kabila may find a way to remain in office after his mandate expires in December 2016. Kabila may attempt to change the “locked” Article 220 of the Constitution through a referendum. Kabila’s Minister of the Interior has argued that since the current Constitution was ratified by a referendum, it can be modified by a referendum. While this option is being floated, it is difficult to imagine any circumstance in the next few years in which the Congolese people would vote to change Article 220 and allow President Kabila the third term he seeks. Kabila’s camp is floating the notion that the current Constitution is invalid, which would open the door for the entire Constitution to be declared void on technical grounds. Claude Mashala, the National Secretary of Kabila’s PPRD political party, has argued that the current Constitution is not now nor ever has been legitimate because its drafting in 2005 was a “compromise among belligerents” and the people who voted in the referendum “had no choice” but to accept it in order to have peace. Mashala has also argued that since a number of provisions in the Constitution are not in effect, the current Constitution is not functioning. Most notably, he points out that Article 2 of the Constitution states that the DRC is made up of 25 provinces, plus Kinshasa, whereas these 26 political divisions have not yet been created and the DR Congo continues to be composed of 10 provinces, plus Kinshasa. Mashala’s statements may be intended to strengthening his case that the current Constitution is not a living document that guides the state. In a particularly creative argument for keeping Kabila in Office, Claude Mashala, National Secretary of Kabila’s PPRD party, has contended that the clock on Kabila’s presidency must be stopped for the period of time during which the M23 rebel group wrought havoc in the eastern region of the country as it required all of Kabila’s attention and he was unable to pursue his program and vision. Mashala makes the analogy to a soccer game. It is necessary for the game to take 90 minutes, he explains, but when there is unruliness in the stadium, the referee must stop the clock and only restarts the clock when the unruly behaviour has ceased. 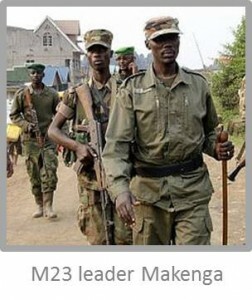 By excluding the period of time during which the M23 rebels created unrest in the east, Mashala calculates that Kabila’s 5-year term in office will end around September 2018 rather than December 2016. In October 2013 President Kabila said there must be a national census before the next national elections, and a few months later, Mashala referred to a census as a “prerequisite” for national and presidential elections. In principal, a census of the population is desirable, but in practice, the door to door task in a country as large as the Congo and without basic transportation infrastructure would be extremely challenging logistically and take years to complete once started. Carrying out such a census would be expensive and there are currently no financial resources set aside for it in the federal budget. Insisting on a census as a prerequisite for national elections translates into delaying the presidential elections and extending Kabila’s time in office. The easiest course of action for President Kabila may be simply to ensure the next round of presidential elections are not scheduled. The Independent National Electoral Commission is responsible for setting the exact date of the next presidential elections. According to the Constitution, the Electoral Commission must schedule the presidential elections to take place within 90 days before the end of the presidential term (December 20, 2016). Last October, President Kabila promised that the Electoral Commission would release an elections roadmap on November 8th. This didn’t happen and Congolese leaders continue to push to see the 2014-2016 election roadmap. When it was finally published in 2014, it included only local elections in 2015. As of late August 2014, no date for the presidential elections has been set. In the DR Congo, the scores of political opposition forces are notoriously fractious; however, the spectre of President Kabila staying in office beyond his second term has united them like never before. In a country where the political opposition has been persistently fractured, there has been a remarkable sense of unity against a third term for President Kabila and against any modifications to those articles of the Constitution that would impact elections. The top political opposition leaders, Martin Fayulu, Vital Kamerhe, Jean-Bertrand Ewanga, and Etienne Tshisekedi (all Members of Parliament) jointly called for a public rally on Aug 4 to protest any attempts to change the Constitution. There is also a massive united opposition by dozens and dozens of national and regional civil society organizations to a modification of Article 220 and continuance of President Kabila in office beyond 2016. The Association of Professors of University of Kinshasa has spoken out against a constitutional revision. The Catholic Church bishops and National Episcopal Conference of the Congo have called on the government to hold the national elections on time. Aside from Kabila’s own political party, the leader of the Congo’s largest Protestant Church, the Church of Christ in the Congo (ECC) is a lonely voice speaking in favour of changing the “locked” Article 220 of the Constitution. The international community is paying attention. The United States has taken the lead by publically calling on President Kabila to step down after his second term in office is complete and urging him not to attempt to modify Article 220. Kabila has been asked directly whether he will step down after his term is over, but he says nothing, fuelling fears that his intent is to stay on as President after his current mandate ends. No date has yet been set for the next presidential elections. The wheels are in motion for a challenge to the Constitution. Kabila’s PPRD party is circulating a petition in Parliament to change the Constitution, although no specific articles or sections of the Constitution are mentioned. Of tremendous concern is the escalation of actions by state security forces against free speech, freedom of movement, and freedom of assembly. Most notably, following the August 4 public rally to oppose any changes to Article 220, Jean-Bertrand Ewanga, a Member of Parliament and a key opposition leader, was arrested on charges of insulting the President and inciting racial hatred (Ewanga called President Kabila “a thief and Rwandan.”). Ewanga remains under guard. May 1997 Laurent-Désiré Kabila overthrows President Mobutu and declares himself President. Jan 2001 President Laurent Kabila is assassinated. His 30-year old son, Joseph, is appointed President. Dec 2005 In a referendum, Congolese voters say “yes” to the new Constitution. Oct 2006 Joseph Kabila wins the presidential election and starts his first term in office. Internal and international monitors describe the election as free, fair and democratic. Mar 2010 The Independent National Electoral Commission recommends a number of modifications to the Constitution, and suggests “deep reflection” on the two-term Presidential limit. 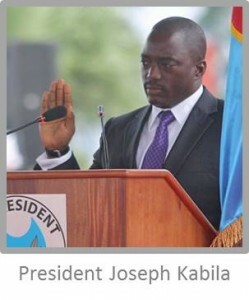 Jan 2011 The Parliament and Senate eliminate the requirement for an absolute majority to win presidential elections, tipping the scales decidedly in favour of Kabila in the upcoming November 2011 elections. Jul 2011 A new electoral law is adopted that replaces proportional representation with a new system that favours larger political parties, including President Kabila’s PPRD party. Nov 2011 The Election Commission declares Kabila winner of the presidential elections. Local and international observers describe the elections as “deplorable” and so fraudulent it’s impossible to know who won. Oct 2013 Kabila says he wants wants provincial leaders to be indirectly elected by local councilllors—a change requiring a constitutional ammendment. Opposition leader Jean-Bertrand Ewanga along with Vital Kamerhe speak out against any constitutional revision. Jan 2014 The Electoral Commission presents the much-awaited electoral roadmap, but it contains provisions only for local elections in 2015, not for local, provincial and national/presidential elections in 2014-2016 as expected. The Commission also formally presents an option for the indirect election of provincial leaders. Feb 2014 A large coalition of civil society organizations rejects the notion of indirect elections, citing the potential for corruption and need to maintain peace in the country. Mar 2014 The PPRP, President Kabila’s party, circulates a petition to revise the Constitution. Civil society organizations and opposition leaders speak out strongly again any Constitution ammendment. May 2014 The United States urges President Kabila not to run for a third term in office, to hold presidentia elections on schedule before the end of 2016, and not attempt to modify Article 220. The Electoral Commission releases a detailed schedule for local elections in 2015 and omits a date for presidential elections, saying a census is a prerequisite for holding any further national elections. Jul 2014 The Minister of the Interior says the Constitution can be ammended by referendum since the it was ratified by referendum in the first place. In an unprecidented show of unity, Vital Kamerhe, Martin Fayulu and Etienne Tshisekedi issue a joint call for a public rally on Aug 4 to protest any constitutional revision. Aug 2014 Large public rallies are held in Kinshasa and other cities. Jean-Bertrand Ewanga, a Member of Parliament and key opposition leader is arrested and imprisoned for insulting the President and inciting racial hatred for saying President Kabila is a “thief and a Rwandan” at the Aug 4 rally.